The 1947 film, Shoot to Kill (also known as Police Reporter), opens with both a bang and a crash. The police are chasing a car down one dark and lonely road. When that car crashes, the police are shocked to discover who was inside of it. Two men and one woman, all well-dressed. The men are both dead but the woman is merely unconscious. The police identify one of the men as being the notorious gangster, Dixie Logan (Robert Kent). It makes sense that Logan would be fleeing the police but what about his two passengers, newly elected District Attorney Lawrence Dale (Edmund MacDonald) and Dale’s wife, Marian (Luana Walters)? The police may not be able to get any answers but fortunately, there’s a reporter around! Mitch Mitchell (Russell Wade) is a crime reporter and, seeing as how he knew both Lawrence and Marian, he seems like the perfect person to get some answers. (In fact, it was Mitch who first suggested that Lawrence should hire Marian as his administrative assistant, therefore setting in motion the whirlwind romance that would end with them married.) Mitch goes to see Marian in her hospital room and he asks her what happened. It’s flashback time! Yes, this is one of those films where almost the entire film is a flashback. That, in itself, is not surprising. Some of the best film noirs of all time were just extended flashbacks. (D.O.A, Double Indemnity, and Sunset Boulevard, to name just a few examples.) What sets Shoot to Kill apart is the fact that, occasionally, we even get characters having a second flashback while already in someone else’s flashback. We’re through the the film noir looking glass here, people. Lawrence Dale, we’re told, was elected district attorney because he managed to secure the conviction of notorious gangster Dixie Logan, despite Logan’s insistence that he was no longer involved in the rackets. However, what we soon discover is that not only was Logan actually innocent but Dale specifically prosecuted him as a favor to some of Dale’s rival gangsters. That’s right, Lawrence Dale was on the take! It also turns out that Marian has some secrets of her own. When she first showed up at Dale’s office, she was doing more than just looking for a job. As for her marriage to Dale …. well, I really can’t tell you what the twist is here because it would spoil the entire film. Shoot To Kill may clock in at just 64 minutes but it manages to pack a lot of twists and turns into just an hour. In fact, I’d argue that it probably tries to do a little bit too much. At times, the film is a bit difficult to follow and a few inconsistent performances don’t help matters. For instance, Russell Wade is likable as the crime reporter but he still doesn’t exactly have a dynamic screen presence. Much better cast are Luana Walters and Edmund MacDonald, who both do a good job as, respectively, a femme fatale and a sap. At the very least, history nerds like me will be amused by the fact that Edmund MacDonald was obviously made up to resemble Thomas E. Dewey, the former Manhattan District Attorney who twice lost the U.S. presidency. The best thing about Shoot To Kill is the look of the movie. Filmed in grainy black-and-white and full of dark shadows, crooked camera angles, and men in fedoras lighting cigarettes in alleys, Shoot to Kill looks the way that a film noir is supposed to look. Regardless of whether it was the filmmaker’s original intention, Shoot To Kill plays out like a low-budget, black-and-white fever dream. It’s definitely a flawed film but, for lovers of film noir, still worth a look. 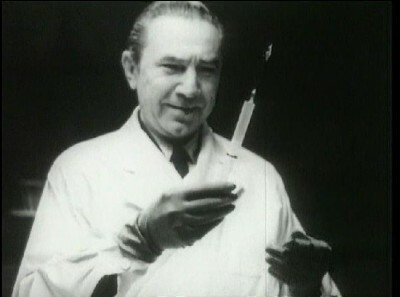 A little over a week ago I wrote about Bela Lugosi’s pairing with The East Side Kids , and mentioned what’s been come to know as “The Monogram Nine”. These Poverty Row horrors were ultra-low-budget schlockfests made quickly for wartime audiences, and though the films weren’t very good, they gave Bela a chance to once again have his name above the titles. From 1941 to 1944, the Hungarian cranked out the rubbish: THE INVISIBLE GHOST, BLACK DRAGONS, THE CORPSE VANISHES, BOWERY AT MIDNIGHT, THE APE MAN, VOODOO MAN, RETURN OF THE APE MAN, and the two East Side Kids entries. 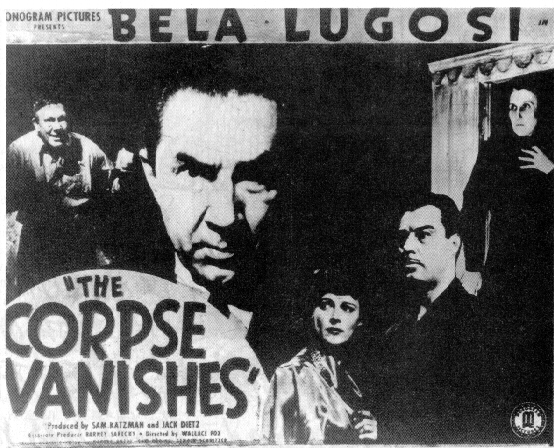 Let’s take a look at a typical Lugosi vehicle, 1943’s THE CORPSE VANISHES. About a month ago, for reasons that I’m sure made sense at the time, I decided it would be fun to watch and review all 50 of the films included in Mill Creek’s Fabulous Forties box set. If you know anything Mill Creek box sets, then you won’t be surprised to learn that the majority of these 50 films are public domain B-movies. A few of them have been good, a few of them have been bad, and a few of them have been forgettable. I have to admit that, as much as I love watching old movies, there’s a part of me that’s more than ready to move onto the next Mill Creek box set, the Nifty Fifties. But, before I do that, I have to finish up the Forties. Fortunately, I just watched the 25th film included in the Fabulous Forties and I am happy to say that I am now halfway done with this project! Yay! As for the film itself, it’s a 63-minute film from 1941. Though it was later retitled Drums of Africa, it was originally called Jungle Man. As for what Jungle Man is about … well, it’s mostly about stock footage. There is kind of a plot. Wealthy Bruce (Weldon Heyburn) and his friend Alex (Robert Carson) want to go to Africa so that they can see the legendary City of the Dead. Bruce’s fiancée, Betty (Sheila Darcy), decides to accompany them because she wants to visit her brother (Charles Middleton), a missionary. Once they get to Africa, they also meet a doctor (Buster Crabbe) who is trying to find a cure for a fever that is wiping out the native population. But really, the plot is mostly just an excuse for stock footage. We watch as our explorers walk down a jungle trail. Someone says, “Look up in that tree!” We cut to grainy footage of a monkey in a tree. Cut back to everyone looking upward. Cut back to that monkey in the tree. Suddenly, we hear a roar on the soundtrack. Cut to slightly less grainy footage of a tiger running through a field. Cut back to the explorers saying, “Look out, tiger!” Cut back to the monkey climbing up higher in the tree. Even when our heroes finally reach the City of the Dead, we don’t actually see them walking around the city. Instead, we see them staring into the distance and then immediately cut to some still shots of what Wikipedia identifies as being Cambodia’s Angkor Wat. Of course, no attempt is really made to match any of the shots. If Jungle Man was made today, they could just CGI the Hell out of it. But since it was made in 1941, audiences had to suspend their disbelief and accept shots that didn’t particularly match up with any other shots and a storyline that was pretty much determined by whatever stock footage the producers had available. On the plus side, it’s only 60 minutes long and some of the stock footage is fun, particularly if you like cute monkeys or fierce tigers. For the most part, it’s silly but inoffensive.